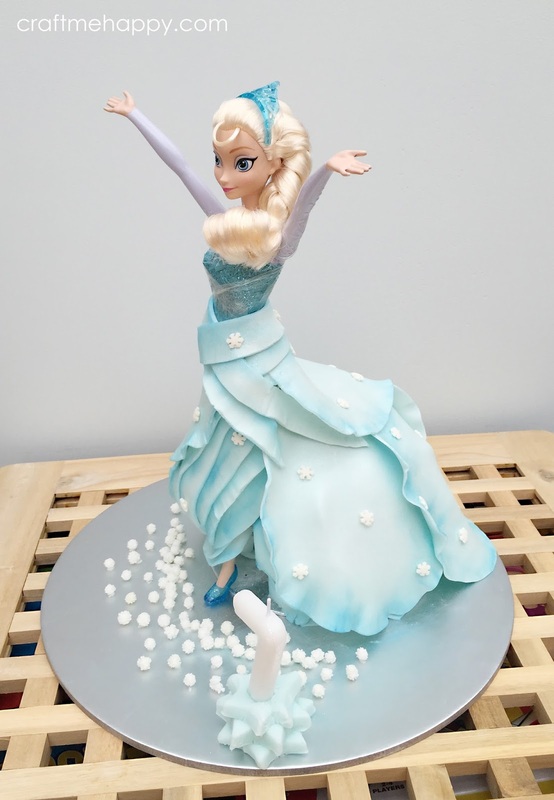 I thought I'd share a couple of pictures of the Elsa cake I made for my daughter's 7th birthday this weekend. She's very much into the imagery of Frozen and loves to play with the Elsa and Anna dolls, so I wondered if I could find an idea for an Elsa doll cake that I could put my own spin on. Full credit for this cake design goes to Lacey Todd of Laceyjakescakes cake blog. 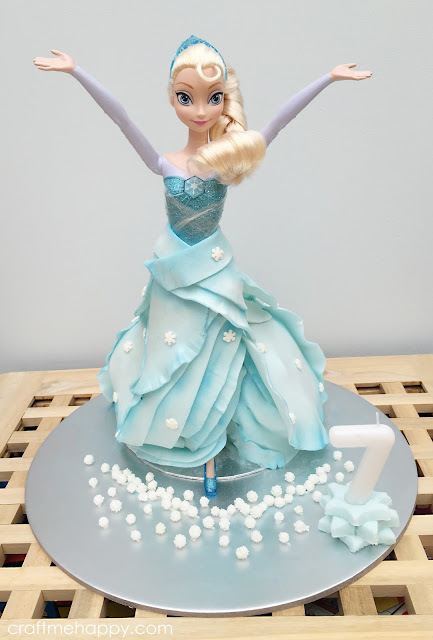 I discovered a link to her tutorial on Pinterest and when I read through her detailed blog post it sounded like something an amateur cake decorator like myself might be able to recreate. 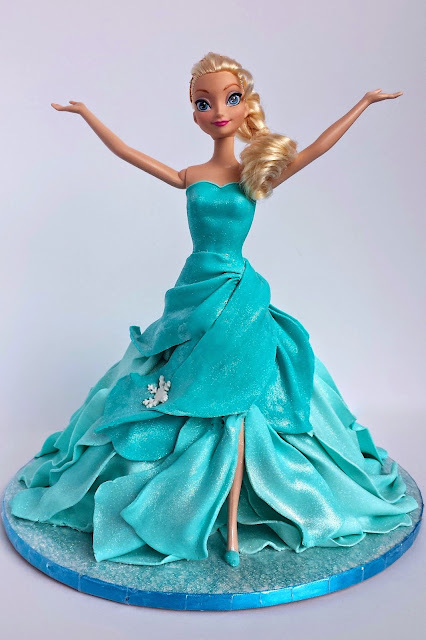 Do have a look as she gives a step by step photo tutorial of how she made her "walking doll cake". 2 packets of Betty Crocker cake mix. I used about 1 and a half packets. 2 kilos of white fondant icing - 1 for the cake and 1 for the skirt. A very small amount of Wilton sky blue gel colouring applied on the end of a cocktail stick. Tylose powder to mix into the fondant icing for the skirt layers. 1 x flower wire for wrapping around her leg to insert into the flower spike. 1 x flower spike to insert into the cake to stop the wire from touching the cake. Paint brushes for brushing on edible glue and the dusting powders. Glacier blue edible lustre powder - applied just to the edges of the skirt layers. Pearl white edible lustre powder - applied all over the skirt. Royal icing in a piping bag for attaching the snowflakes and sprinkles to the cake and board. I must confess it wasn't quite as easy as Lacey made it look. I really struggled to get the front layers to stick, so I ended up with a lot more layers at the front than intended as they just kept slipping down. Gravity and humidity were definitely working against me! I actually ended up leaving the front to harden overnight which made it much easier to attach the rest of the skirt in the morning. With all the difficulties I was having getting the many strips to stick, I decided to speed things up by using much larger layers for the back of the cake. I just rolled out my sugar paste (which I'd mixed with tylose powder to make it more workable) into vary large petal shapes and then frilled the edges with a cocktail stick. I then used edible glue to attach them. These stayed in place much better than the narrow strips and really speeded up the completion of her skirt. The doll is actually a singing doll which is why her bodice is wrapped in cling film. I didn't want the sugar paste or dusting powders to get inside her and affect her electrics or speaker. It also helped using a doll with a moulded bodice because it meant that I didn't need to make one out of sugar for her. I'd like to give a huge thank you to Lacey Todd for the incredibly detailed tutorial that she so generously provided. The cake was a huge hit with the girls at my daughter's party and they really couldn't believe that it was actually a cake!